This sepia colored postcard shows members of the Grand Army of the Republic on the steps of the capitol in Topeka, Kansas. 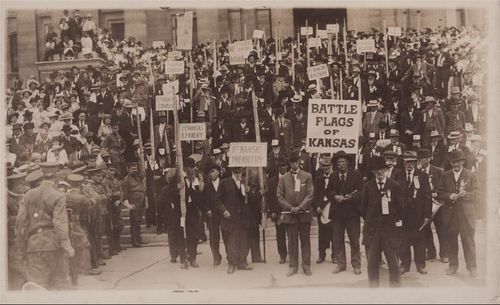 Some of the members are hold signs which reflect their regiments and one sign reads "Battle Flags of Kansas". The gathering on the steps was a ceremony of removing flags from the capitol and transporting them across the street to the Memorial Building at Tenth and Jackson the headquarters of the GAR.